Right - an update on the hour glass quilt from Jelly rolls. Here you can see how I have used wormholes in a variegated thread on the large blocks of colour. I love the freedom of filling the space with texture. I know when I am knitting I love texture more than colour so it comes as no surprise to me that this is the case here. What has surprised me is how much like 'me' it turns out. In the large white blocks between the bow ties I have placed a bubble spiral and surrounded it with pebbles. As I was saying, the FMQ is turning out to be very like my handwriting or sketching. So it has my character all over it. I watched a lot of tutorials from Leah Day on youtube and sketched out designs to get the feel of how the stitching would flow. I only drew the barest of outlines, a square, a spiral and then took it from there. The freedom that this gives to express how you want is amazing! If you squint closely you can see how on the patterned parts of the bow tie blocks that I have quilted very lightly , taking inspiration from the fabric itself, so plaids have straight lines, stars are quilted in a diamond lattice and spots have zig zag lines joining them up. Around the edges I am putting a half flame flower - for this I sketched out the semi circle and the rest is freehand. Interestingly, Leah herself admits that she is a neat freak when it comes to sewing, her stitches are always the same length and the distances apart are exact - she has some great 'loose' designs but also admits to being a touch OCD on the symmetry side of things. I have found quilting this monster to be a huge learning experience and I can honestly say I think at last I am finding my style. Here you can see more of the beast - It is turning more into a whole cloth quilt by the minute! In the past I have always been about the design of the fabrics and how they fit together and create secondary patterns. 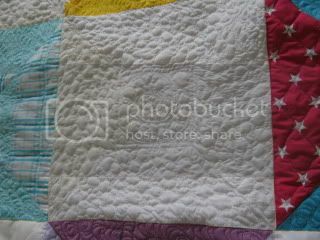 With this quilt I have felt that finally the quilting and the piecing are coming together a whole lot more. I have loved the way that the designs have an organic freeform to them that lends them a fresh, modern edge. Unfortunately half term is nearly over and I don't know when I will get such a block of time to sew again as I have had this week. Tony goes away later in the month for a few days so I could be back in my room of joy sooner than I think. The whole of the central portion is done now, and I am half way through the flame flower blocks around the edge. After that is is borders and binding. It is not the neatest of work, I have worked myself into a corner at times - but it is mine!I have learnt so much from this project, and the encouragement, inspiration and information from the folks on the boards have kept me going. Hopefully I will get it finished before 4 years are up!! Next project is to quilt the Jazzy block swap that we did and see if I can now do something dramatic with that instead of just stitching in the ditch. Just superb, Jan!!! 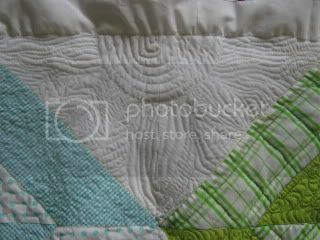 I'm sooooo glad to see your quilt and all the texture you've quilted into it. I can definitely relate to your pride & enjoyment of the FMQ. Soooo glad that you've hit your stride and just love your style! OMG, Jan!! To my untrained eye all I can say is..........You Are A Natural. I'm so impressed. With a little knowledge the Quilting Beast has been unleashed!! Brava! Thanks Judy, means a lot from the Queen of Quilting! I no longer consider myself a complete novice, but I have yet to churn out the volumes that some of you people do. 1 quilt every 4 years is a bit on the slow side. As with everything you do, IT IS SUperb! ! I love it.. Thanks Libbs and belated Happy Birthday! See that variegated thread put to good use? 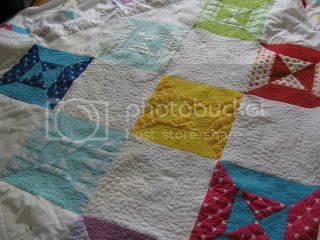 Jan, I have to agree that you are a natural talent Thanks for sharing, I love the colours in this quilt. I am putting together practice sandwiches for FMQ. I will have time after July to really focus on my sewing/quilting/scrapbooking projects. I am always inspired by the posters on this forum. Take care. 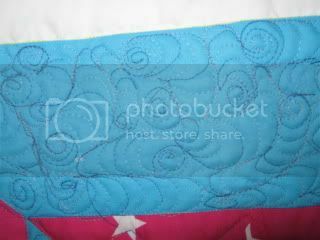 I love how you describe your quilting being part of you and your personality coming through! You hit the nail on the head Jan. That's how it is. Once you find that flow, it just goes on and on. I've never heard it explained like that, but it's exactly how it is! I love it! The quilt is gorgeous!